It’s time for another Town Hall! 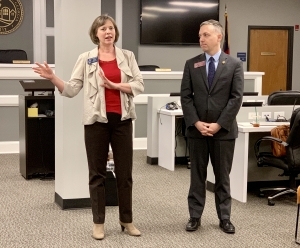 Please join Representative Mike Wilensky and me at Dunwoody City Hall on Tuesday, March 19 at 6:00 pm. Thank you to everyone who came out to the Town Hall in Brookhaven with Representative Matthew Wilson. It’s great to see so much interest in what’s happening at the Gold Dome. We are three-quarters the way through the 2019 legislative session, and we have 75% of the work left to finish. This is the time when arm-twisting runs rampant. It is during times like this that I pull out my copy of John F. Kennedy’s “Profiles in Courage” and re-read Section One, in which Kennedy outlines the various Senatorial pressures. Kennedy explains how post-election, the legislator’s constituency expands to include all voters (including those outside the circle of support), legislative colleagues, Party leadership, state-wide special interest groups, corporate interests, and local governments. Needless to say, these constituencies don’t always agree, and as legislators we must figure out how to negotiate these conflicting interests. Kennedy describes how the pressure to “go along to get along,” can cause the legislator to subdue the conscience, and unfortunately, many do. Others choose paths of compromise, and a few march out alone and face not getting re-elected. Courage and arm twisting are the oil and water of politics. Ultimately, I believe that in the end, a legislator must vote his or her own conscience, but remaining true to this under pressure is challenging. That’s why I have my yellow values card! 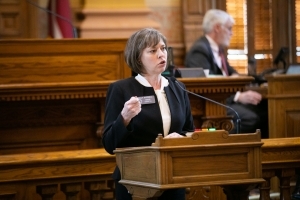 On another lighter note, and speaking of legislative colleagues, did you know the Georgia Senate has its own John F. Kennedy? He’s a Republican, and he’s from Macon, Georgia. Voting machines still dominated my work this week. But other tough issues came up too. Voting Machines: The debate over voting machines has been a clear example of the conflict between constituencies and conscience. 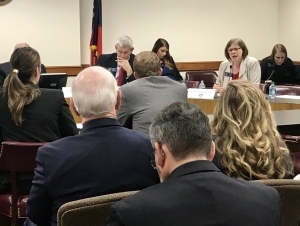 Since HB316 came to the Senate, I personally shared my concerns in meaningful conversations with some of my Republican colleagues and found they had some concerns too. Some worried about the costs and a few didn’t like the systems that scanned a barcode instead of the text on the paper ballot printouts. The Lt. Governor told us he supported an open floor debate when we met with him early in the week. I wrote my floor speech with my Republican colleagues in mind. I wanted to share my own initial reservations about handmarked paper ballots but how in the end, my extensive research showed that the electronic ballot marking devices were too new, largely untested, and not ready for such a large contract. I wanted to appeal to their conscience instead of putting their faith in a system being pushed by the Governor, the Secretary of State, and their preferred vendor. But going into the floor debate, we knew which constituency had won out. Any doubts my Republican colleagues had suddenly disappeared. The bill was “engrossed” which meant we wouldn’t be allowed to offer any amendments from the floor. At my urging, the Democratic caucus took a strong collective stand against HB361. Minority Leader Steve Henson invoked the Senate rule that requires a fiscal note, a detailed analysis of costs, that is required for any bill with a major impact on our state budget. But the Lt. Governor ruled it not necessary because some money was already allocated in the Governor’s amended budget. Sen. Henson also moved to table the bill to give us more time to get a fiscal note and understand the full cost ramifications, but the motion failed with a party line vote. We made our floor speeches and answered some tough questions. But in the end, it was clear that the Republicans were going to vote with their party and preferred vendor and the bill passed along party lines. The House passed and amended the bill after a very similar debate and party line vote. And now the Secretary of State has already issued an RFP, even though the Governor has not yet signed the bill into law. Honoring Community Servants: It was nice to get a mid-week reprieve from contentious bills and partisan politics at the Women’s Legislative Caucus Nikki T. Randall Servant Leadership Awards breakfast. Later in the Day, Georgia Public Broadcasting (GPB) held a reception for the Women’s Caucus that included a program about human trafficking. Representative Shelly Hutchinson, a social worker, and Senator Renee Unterman, a social worker and nurse, spoke about their experiences with victims of human trafficking in Georgia. It was eye opening and upsetting, but the Women’s Caucus resolved to take this on together as a bipartisan issue in the future. GPB committed to support the effort with a televised event on the issue. The Shellfish Bill Got Contentious! : Believe it or not, shellfish came up again in the Natural Resources & Environment Committee and it was not peaceful! While the bill to allow for mariculture, aka shellfish farming, along the Georgia coast passed the Senate with very little debate, a similar bill, HB501 passed the House, but not without significant conflict. That conflict spilled into the Senate Natural Resources and the Environment Committee this week as we considered the House bill. We watched quite a debate between the bill author and a Representative from coastal Georgia who opposed the bill. At issue was the amount of time mariculturalists can farm along the coast in a year. It was a conflict between food safety and economic interests. I ultimately voted against the bill so the conflict could be resolved, but it passed the Committee. It will now go to the Senate Rules Committee and then the Senate floor. Dual Enrollment: Participation in Georgia’s dual enrollment program, a state-funded opportunity for high school students to earn high school and college credit at the same time from a Georgia college, has grown approximately 500% in the last few years. Both of my kids benefitted from dual enrollment so I was very glad to be able to work on HB444. The bill would limit program funding to 30 credit hours per student and anything beyond that could be covered by tapping into the 127 credit hours allocated to eligible students for Hope scholarship funding. The bill also makes ninth and tenth graders ineligible for the academic program and ninth graders ineligible for the technical school program. In the meeting, I learned that the grade limitations are not for financial reasons but because of maturity concerns. While we need to address the budget, I’m not in favor of grade level limitations. Dual enrollment has been a great solution for gifted kids who need more challenging curricula than what their high schools offer. Maturity should be based on individual students and a decision that parents, not the government, should make. But the popularity of dual enrollment is a symptom of the larger college affordability issue. Dual enrollment allows kids to get a head start on their college degree without having to dig deep in their pockets. We must take on the high cost of education and low wages that makes college out of reach for far too many. I will be offering amendments to HB444 when the Higher Education Committee meets to vote on the bill next week. And I’ll be pushing for solutions for the larger problem of college affordability. 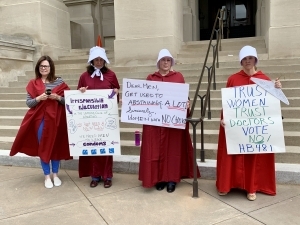 “Heartbeat” Abortion Ban: There were handmaids in the halls of the Capitol this week, as doctors, pro-choice and pro-life citizen advocates came to lobby for and against the most contentious bill of the session — HB481, a bill to ban abortion after 6 weeks of pregnancy. On Thursday, the Science and Technology Committee heard 45 minutes of testimony for the bill and nearly 90 minutes of testimony against it. Those testifying against the bill were largely doctors, nurses, and public health officials that said that the bill’s definition of “life” conflicted with that of all major medical association and medical training. They said it would not allow them to provide the standard of care that they are trained to offer. They were highly concerned that the bill would dissuade medical professionals from practicing in Georgia when Georgia already has the highest maternal mortality rate in the country and 80 Georgia counties have no practicing ob-gyns. The bill will get a vote in Committee next week and will go on to the Senate Rules Committee. Here’s your opportunity to BE LOUD. Call the Senate Rules Committee and tell them whether you think this bill deserves a floor vote. I am sad to report that my secretary, Anna Boggs, has been out for the past two weeks to care for her elderly mother who has had some health concerns. We’ve missed her during her absence and we are not sure when she will be back. In the meantime, we welcome Senate Aide Peter Tilly. Peter is young (19!) and very talented. He has been helping us catch up with items we may have missed while we were understaffed. You can reach Peter at my Senate office number (404) 463-2260 or by email peter.tilly@senate.ga.gov for page requests and other needs. We appreciate your patience with us during this transition. Subscribe to receive emails from Sally. Our supporters are the heart of our campaign. Thank you!